Rent villas and apartments in Igrane, Croatia. This nicely furnished holiday home is located on the beach in the centre of small idyllic fishing place Igrane. It comprises spacious ground floor with a kitchen and covered porch. This old Dalmatian semi-detached holiday home, restored in authentic style, is located in Igrane on the riviera of Makarska. 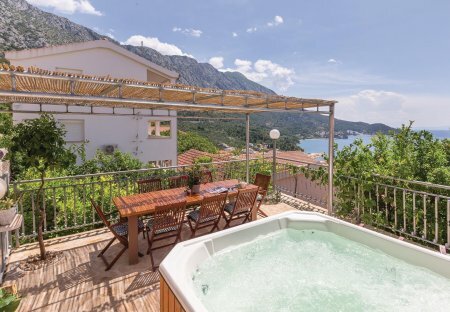 This terraced house is located in a small fishing village Igrane on the popular Riviera of Makarska. The traditional way of construction has conditioned the specific interiors. This elegantly furnished apartment is located on the second floor in Igrane, on the beautiful Makarska Riviera. The apartment consists of a living room with a kitchen and dining area, two bedrooms.